As promised, Princess Märtha Louise of Norway turned 40 in style with a bash this weekend. I have to say, I'm a little sad there was no bedazzling of the number 40 involved. How will we remember what occasion she was celebrating as the years pass? Here's what I think happened: the dress Märta Louise ordered for the party came in just a little too lovely and normal, so she had Ari toss her the scissors...and here we are. And also she put her hair on backwards. There was a private dinner at the palace on Saturday, and it drew a very interesting royal turnout. Mette-Marit is traveling, so she was a no-show, and there were no Swedes to be found either (Princess Christina's son was married in France this weekend, so that could be why). Also, a surprisingly large Dutch contingent was in attendance. Sad faces all around because we got nary a glimpse of the royal guests coming or going, but we did get one group photo. So we'll forge on with a slightly modified version of our regular fashion awards. Stand outs only! 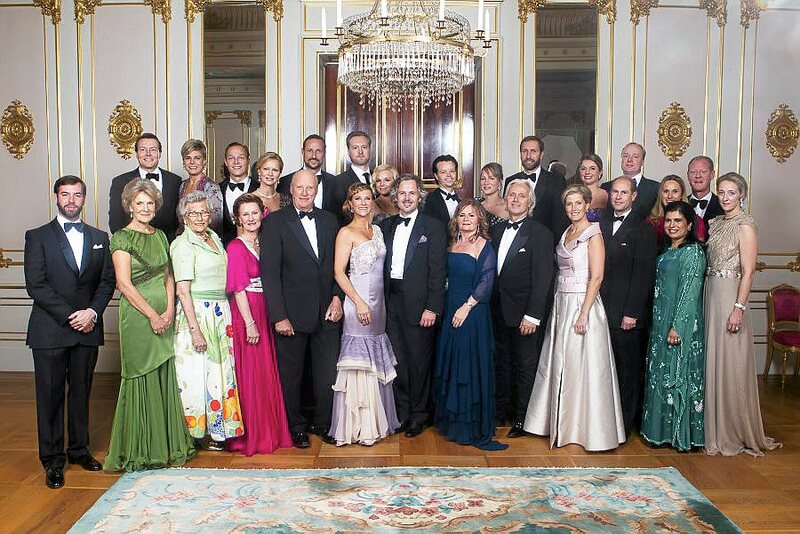 Back row, left to right: Prince Constantijn and Princess Laurentien of the Netherlands, Prince Jaime of Bourbon-Parma, Princess Carolina of Bourbon-Parma, Crown Prince Haakon, Christian Udnæs, Anja Bjørshol, Espen Bjørshol, Catherine Ullens de Schooten, Tjalling Siebe ten Cate, Princess Margarita of Bourbon-Parma, Jean Charles Ullens de Schooten, Princess Annemarie and Prince Carlos of Bourbon-Parma. Worst Burgeoning Rut: Princess Alexandra of Sayn-Wittgenstein-Berleberg, in the same thing she wore for her sister's wedding earlier this summer. Not a bad dress at all, it's just washing her out like nobody's business. Most Improved: Queen Sonja. I like what I see here, that little fuchsia number. Seems she's toned down her usual unique sense of style to allow her daughter's to take center stage. This should happen more often. Most Entertaining: Princess Astrid, in her flippy ankle length garden skirt. She came dressed for a skip through a spring meadow! Gotta love that. Best Dressed: Princess Irene. She's not a common attendee at royal events (Irene is one of Queen Beatrix's sisters, who lost her place in the line of succession when she married Prince Carlos Hugo of Bourbon-Parma - they divorced in 1981). But she should be, because look how elegant she is in her green dress. Bonus points for bringing all four of her children and associated spouses. What did you think of the birthday girl's outfit, and which guest was your best dressed?